One of the greatest love stories based on the iconic film with Jennifer Grey and Patrick Swayze. The movie Dirty Dancing was a worldwide hit and the soundtrack generated 2 multi-platinum albums! 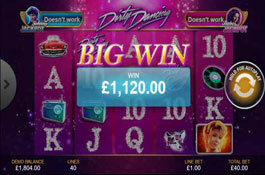 This 5 reel, 40 payline slot will bring back many memories. The well known soundtrack accompanies gameplay, the reels spin in a haze of pink and purple stars. Meet with Johnny and Baby in that famous resort at Catskill Mountains dancing the night away to 1960's music. This beautiful couple will award lots of lucrative payouts as they have the time of their lives! Randomly triggered features include Spin the Wheel to win extra Free Spins, Dancing and Whirling Wilds, 2x Multiplier and Progressive Jackpots. Johnny, Baby, Penny, Radio, Vinyl Record, Red Car, Dancing Shoes and more characters from the actual film. Glittery playing cards A, K, Q, J and 10. Coins Range from 0.40 to 1 000.00. The bet level can be set from 0.01 up to 10. The Johnny Wild will substitute for all others symbols except for the Dirty Dancing Scatter. 5 Wilds in a line will award 5 000 coins. 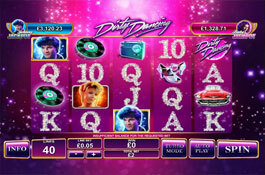 The Scatter symbol does not have to be lined up on a payline to award a win – land 3 or more scatters anywhere on the reels which will lead to an instant cash prize. Spin the Wheel of Fortune to win Mambo modifiers including 3, 4 or 5 extra free spins with a 2x Multiplier for all wins and Dancing Wilds on every free spin. Stop spinning the wheel when landing on Collect which gives an extra 2 free spins. The Dancing Wild is stacked on all reels and appears as 1 long image that occupies 4 positions on the reel. 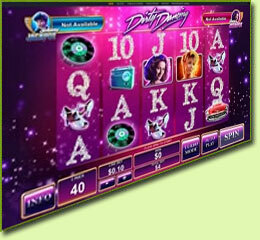 The Dancing Wild symbol remains on the reels for every free spin and changes position at random on each free spin. This is like having stacked wilds on every free spin! During any spin in the base game, Johnny and Baby can dance across the reels. They will add between 2 and 6 random Wilds in any position which can lead to big wins! This is a Pick-Me type of game where you help Baby pick boxes to reveal Cash prizes and Rewards. Collect 3 Matching symbols and advance to the next round of the feature. 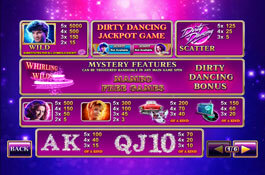 By completing all 6 stages the Time of My Life Jackpot game will be activated. 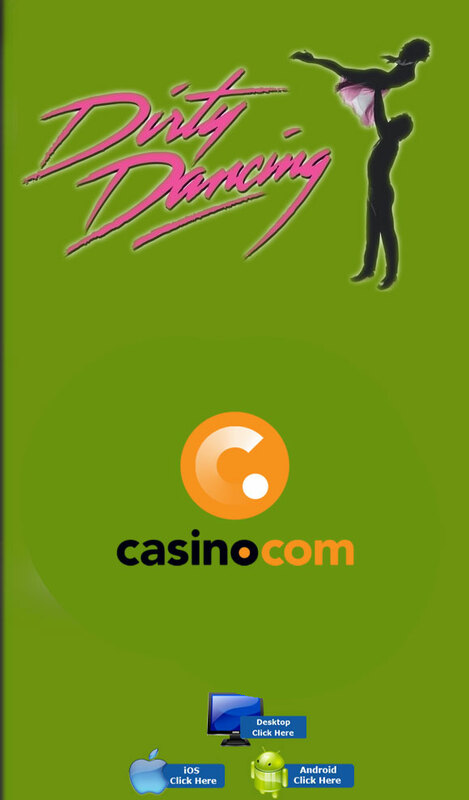 Advance all the way through to the jackpot game in the Dirty Dancing Bonus picking game to win one of the two Progressive Jackpots, Johnny or Baby Jackpot.